Introduction : The basic idea behind the proposal is to integrate authentication and key distribution protocol. Immense work has been done to design a secure key distribution protocol starting with Needham Schroeder and evolving to OAKELEY, SKEME, IKE and ultimately to Diffie Hellman Protocol and PKI. Though much work has been done in the field of Data Integrity, Non Repudiation and Secrecy, password based authentication is still the Achilles heel of cryptography. In the presence of Byzantine Adversaries like Man In The Middle(MITM) even a combination of multi factor authentication and PKI fails. (g, g^a, g^b, g^c), decide whether c = ab mod q or not. answers whether a given quadruple is a Diffie-Hellman quadruple or not). g, h belongs to G.
of Schnorr, we choose to keep the multiplicative notation both for G and G1. From now on, G is a group in which the Gap Diffie-Hellman problem is intractable. and G and G1 are of order q and we denote by g a generator of G.
value g^a obtained by iterating l times the algorithm. Along with the proof of knowledge the public key of the Prover is embedded into the proof so that while verifying the secret’s knowledge, the verifier will also enter the public key of prover as a parameter and verify the authenticity of the secret as well as of the key. So from now onwards, Man In The Middle cannot just forward the prover’s proof and forward his public key to establish a secure channel. MITM will be unable to separate the key part from the proof of secret provided and thus will be incapable of carrying out attacks like active phishing where he first forwards his public key to server and then user’s credentials. By using the proposed protocol server will detect that the credentials forwarded does not belong to the particular public key supplied earlier to establish the secure channel. Step 1: Here Prover choose a random number in the prescribed range and computer W ( a mapping on G1). Then we introduce the public key in the picture and computer mapping of public key using the random number r. ‘r’ is only known to the prover and is created for obfuscation. The result V is sent to the verifier. Step 2: The Verifier computes another random number c and sends it to Prover. Step 3: The Prover uses c to computer a product Y on G, which comprises of secret, unknown r and public key computed r-1 times. Step 4. 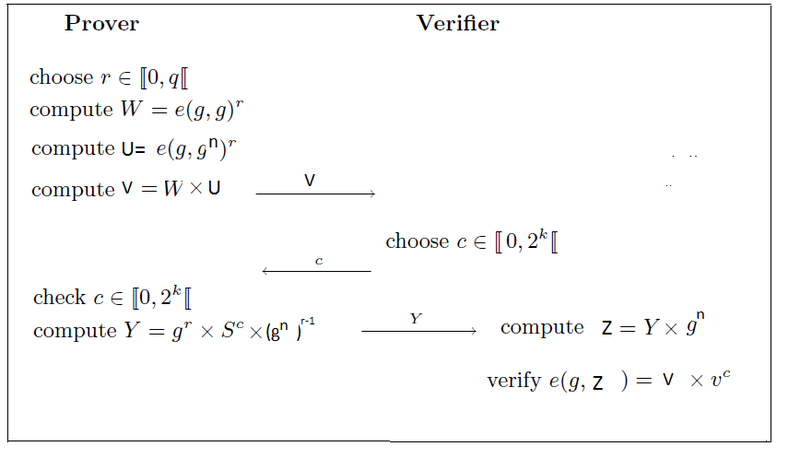 The Verifier multiplies the resultant Y with the known public key of prover and computes its mapping. If the mapping is equivalent to the product of mapping received in step 1 and mapping of secret c times then the proof is accepted. outline of general zero-knowledge proofs. Namely, we prove the completeness and the soundness of the scheme. Finally we prove the protocol is zero-knowledge. Polynomial time Turing Machines (PPTM). which answers ˜c. If c = ˜c then the triple (W, c, Y ) is kept, otherwise M computes method. This entry was posted in Uncategorized and tagged diffie hellman, elliptic curves, multi factor authentication. Bookmark the permalink.